I have seen quite a contrast at different events of the same genre the past month. 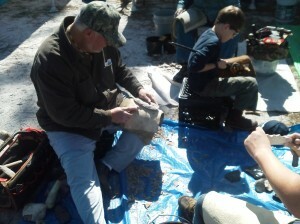 First, I went to a festival known as a flint knapper's gathering. That is where people chip away and make arrowheads and spear points, just like aboriginal people have done here for thousands of years. It looked like a prehistoric hardware store. And after seeing so many, it all seems to look the same. The first knap-in that I visited was at Silver River (now Silver Springs) State Park, near Ocala. It was okay, but it seemed that the knappers or vendors in the tents were not interested in talking with me. They gave the appearance of being an exclusive club that is only interested in other knappers. The atlatl and primitive archery looked good, and I did have a good conversation with the archaeologists, but I was not there for more than 30 minutes, and felt that it was somewhat of a waste of time. The very next weekend I went to a different flint knap-in at Ochlockonee River State Park, between Tallahassee and Apalachicola, near the interesting town of Sopchoppy. Check out the potty guy if you are in Sopchoppy—you’ll find him easy enough. The Ochlockonee/Sopchoppy knap-in was a completely different experience. People were talkative and friendly. Adults and kids were sitting there, chipping away at rocks. Seemed more of a family event more than the one the week before. I even talked with the former park manager from there who had taken the weekend off to come and knock rocks with his old friends. I saw him mentoring some kids to develop their chipping skills. I really liked it. Below is a photo from that event. I took the picture mainly to show people what a flint knap-in is, because they don't seem to understand when I try to describe it to them. Notice the spear points these guys are making, and their tools. It was entertaining just watching. Two events, both at state parks. Same type of events, but one was very good and friendly, and the other seemed like a waste of my time. And the event that was free and didn't charge admission was the better event. Why are they different? This would take longer study it closer to find out, which I won’t dwell on right now. Then, the same thing happened again. I went to two living history events. Both involved black power and musket firing. One, I enjoyed the show, the other was a let-down. I went to the garrison muster at Mission San Luis in Tallahassee. Part of the site has interpreters who show what life was like around the year 1690, including the fort with the Spanish garrison who do cannon and musket firing. I had trouble with my camera and missed the first few minutes of the cannon firing drill, but got the best part. I think that unless you are familiar with the whole drill, it might seem a bit drawn out, so having only a minute of video will make most people happy. To contrast, I went to the reenactment at Natural Bridge battlefield near Tallahassee the week before. I really enjoyed talking with the reenactors like the USCT black soldiers, and the sewing lady. But then it was time for a black powder demonstration. First was the cannon demonstration. We went to watch, but found out that they were only demonstrating the drill and not actually firing the cannon. What is the point, then? That's no fun! Most people are there to see and hear the boom! Then going through the drill, they don't even have all their equipment; no vent pick, so don't even demonstrate a while drill properly. I was pretty disgusted at that point and walked off. I heard from another of my friends who was there, that they had an infantry/musket drill, and didn't fire off the musket, either. Is this proper interpretation, if you have a reenactment but don't fire off any black powder for the demonstrations? I am really opinionated on this and believe that you have to provide a good show. Good interpretation is more than just talking your way through it. It is those provocative experiences that involve all the senses. I once had a job where I would fire off these things, so I know them well. It was like signing up for a boat trip, and standing on shore to watch the boat float by. This is something that people come to experience. If the public wanted to see just a cannon demonstration without the boom, they can watch it on youtube. This is a total failure. Apparently they still got an idea how to do it at the 1690 fort & Spanish Mission park.